Cosy winter knits, pj’s and loungewear. Now that winter is well on its way, I find myself living in jeans, jumpers and hoodies. 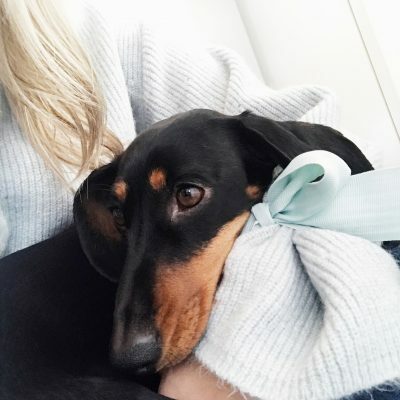 I love coming home, instantly taking my make up off, putting my hair in a top knot and snuggling up in my dressing gown or a oversized cosy sweater. I can’t stand sitting around the house in uncomfortable clothes, that’s when the leggings and pj bottoms come out. I bought the pink sequin penguin sweater the other day, I’m just waiting for it to arrive. I’m also thinking of popping one of these lovely dressing gowns on my christmas list, I just can’t decide which one? I love the pink snowflake jumper, it’s so girly.. I’m not a huge fan of the typical crazy wooly patterned christmas jumpers, but I’m all for cute animal print knits and sequins galore! What do you think of my picks? I want to buy them all! I was quite tempted by the penguin sequin sweater at the weekend – love it! 10 Ways To Sneakily Celebrate Christmas – Now! I love any item of clothing that allows me to snuggle up and be cosy! The dressing gowns look lovely and warm. Cute post! I love the minnie mouse tee!! That dressing gown looks amazingly soft too!! They all look very cozy, but number 5 is my favorite! Such lovely picks for winter! I have the number 5 Cardi from Topshop, and I've worn it so much and it's just like a blanket- so thick and cosy! So cute, really fun how you always find those cosy things together! ohmygosh! That penguin sweater is so cute!! I'm dying. aah. I'm in looove with the polar bear dressing gown, definitely going on my christmas list! I love everything you picked. It's making me feel all warm and fuzzy inside. I'm the same as well. I love wearing comfortable clothing around the house. It makes you feel more relaxed. 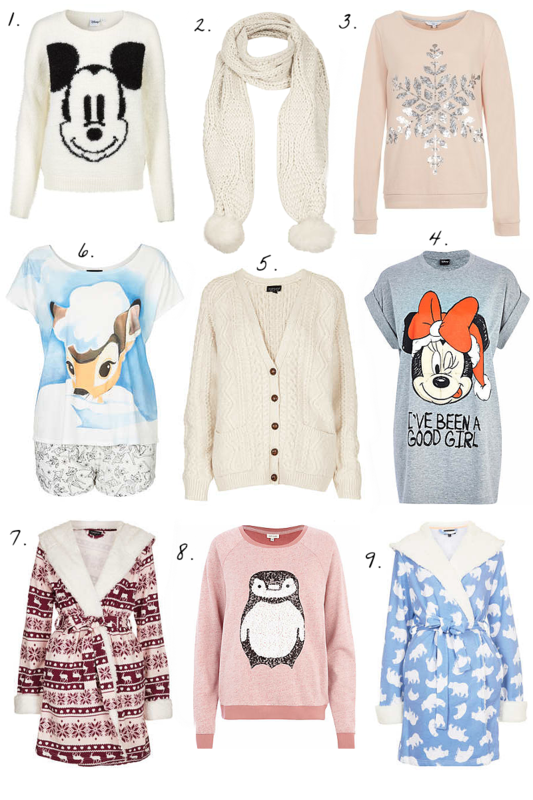 I love cosy jumpers these are all so lovely would love them all! I love the Bambi pyjamas. 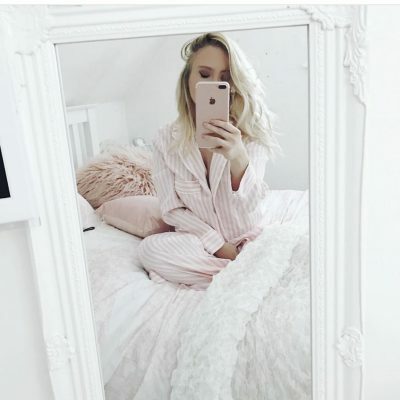 Winter is the perfect time to splash out on lots of cosy nightwear! I love the stuff you've picked out, especially the Bambi pyjamas and the snowflake jumper! I saw the Bambi sleepwear on the Topshop site today and I'm so desperate to get them, even though I prefer long bottoms compared to shorts haha! Their robes are AMAZING though! I bought the teddy robe several weeks ago and I don't think I've gone an evening/night with out wearing it! It's total perfection. Cute picks! Love the Bambi pjs! THE PENGUIN JUMPER IS SO GOSH DARN CUTE! I just had to express my excitement! The polar bear dressing gown is so adorable!! I love them all! I'm super excited for more Christmas sweaters coming out soon; def. checking TopShop soon! I do exactly the same when I get in. Instantly make myself as cosy as possible! Wondering if I can justify a Christmas specific dressing gown, the red one is so cute! the penguin jumper is adorable!! Hope you get all your presents! I need that cable knit cardigan in my life! Winter clothes ♥ I love them all! Need to get a housecoat, I'm loving the reindeer print one! I love all of these things, and your blog! Those dressing gowns look so cosy.. Awesome post. I really like it. soo cool collection of tops for girls !!!!!! nice post ! !